For adults over age 65, surgical complications can dampen not only their physical health but also their mental sharpness, with more than half of high-risk cases declining into delirium. In research published this week in the journal Brain Stimulation, Duke University scientists show in a mouse model that a current treatment for seizures can also reverse brain inflammation, such as inflammation after surgery, and the subsequent confusion or cognitive decline that results. The therapy involves minimally invasive stimulation of the vagus nerve using small electrical pulses comparable to a cell phone's vibrations. 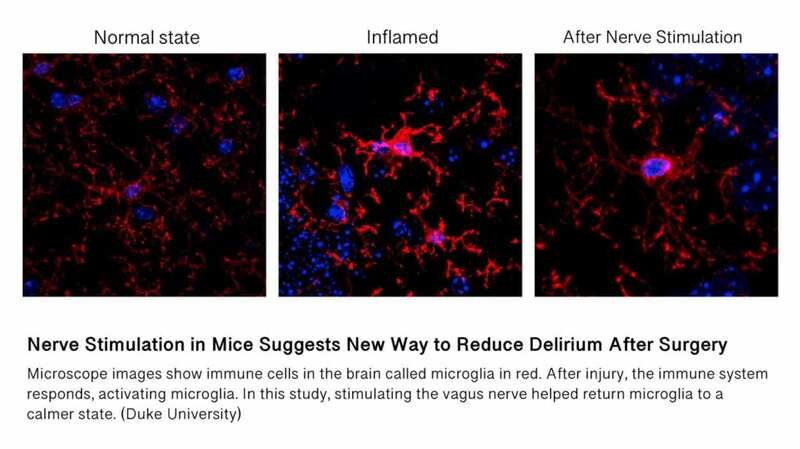 "Delirium is now recognized as the most common complication in older adults after surgery," said Niccolò Terrando, Ph.D., associate professor of anesthesiology at Duke and the study's senior author. "For most patients, it lasts a few days and resolves on its own. For some, it can lead to severe complications and even contribute to long lasting cognitive deficits, like dementia." "So far, there is no therapy for this kind of cognitive complication after surgery," Terrando said. Anti-inflammatory drugs have many side effects and work broadly, he said, and they don't adequately target the inflammation in the brain that scientists believe triggers cognitive complications. "This minimally invasive approach is already exceedingly benign, but in the long term it would be desirable to have an entirely non-invasive approach and we are beginning that work," Grill said.